Men and women of good will are being called upon to rethink the homosexual issue. They are being asked to change the laws of the land to legitimize homosexuality. The American Psychiatric Association, under pressure from homosexuals, already has* removed homosexuality from its list of mental disorders – a move which Dr Charles W. Socarides labeled “the psychiatric hoax of the century. Those who would call for the raising of a white flag toward homosexuals in churches or in Christian institutions never have experienced the horrors of youth seduction by expert male homosexuals, who skillfully initiate their victims into a world of absolute vileness and degradation. 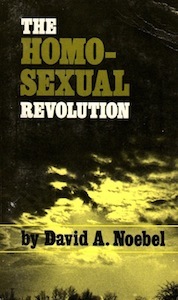 The book is written out of the backdrop of the continuing homosexual revolution. Although the author does not consider himself an expert on the subject, he does consider himself a veteran of the homosexual revolution.